Ah, many artists have seen their work become immortalized during the 20th and 21st centuries including Vincent Van Gogh, Banksy and Pablo Picasslot… wait, hang on, I mean Pablo Picasso! An easy Freudian slip to make considering the masters of craft at Leander Games have developed this dedication to one of history’s finest ever painters. 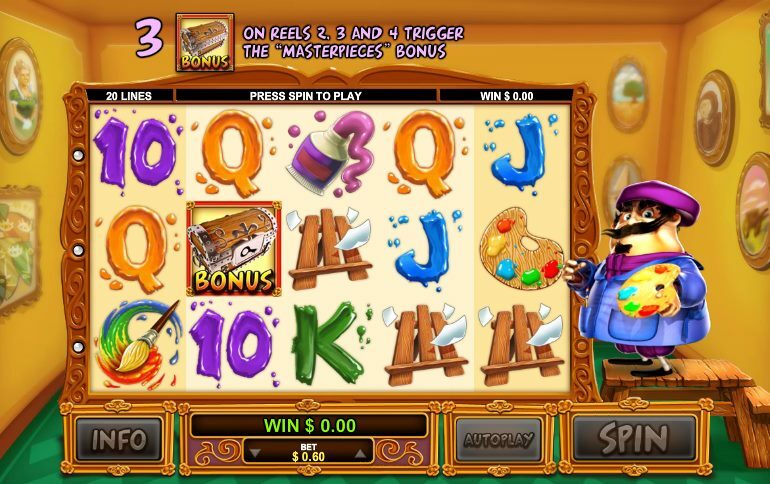 Pablo Picasslot is a 5 reel, 20 pay-line slot that has the trademark Leander Games cartoon style with a touch of comedy thrown in for good mix. Picasso was never seen as one of life’s big comedians but in this slot the parody version of the artistic genius does have slight comical traits. He looks like he would be more suited to a role in an art-themed equivalent of the movie Ratatouille! In fact, I’m beginning to think he is the no-nonsense head chef from Ratatouille! Anyway, onto this slot! The reels are packed with symbols including paint, a paint palette, canvas board plus all the regular 9 through to Ace symbols that are presented as if they were painted onto the reels in different color to add some vibrancy. These Aren't Just Any Wilds... They Are Painted Wilds! The Wild symbol is not represented by a specific symbol. Random symbols on the reels have frames around them and if they land on the reels when the spin ends then the symbols with a frame around them will become Painted Wilds. These Wild symbols will then change from the original symbols into a famous masterpiece. These symbols then act as Wilds and substitute for all other symbols except for the treasure chest bonus and free spins bonus round symbols to complete winning combinations. There is a free spins bonus round to trigger on this slot and if you hit three or more of the Pablo Picasslot free spins bonus round symbols across the reels then you will earn at least 8 free spins. During the free spins, Painted Wilds will appear on the reels at the end of every spin so you can really hit some big wins during the free spins. Genius! There's Also the Masterpiece Bonus! 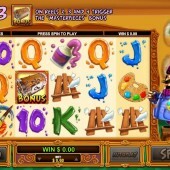 You can also trigger the Masterpiece Bonus on this slot. You must hit three treasure chest bonus symbols on reels 2, 3 and 4 at the same time and this will take you to a second screen. In this second screen, you will have to select from a choice paintings to reveal keys that open boxes to reveal cash prizes. I am becoming a big fan of Leander Games slots with the fantastic Mad Pinatas slot and the music-themed Megadeth slot just two of my regularly played slots. The unique features on offer in this slot such as the Painted Wilds work well and the inclusion of an additional bonus round plus a free spins bonus round makes this a very enjoyable slot to play indeed.